Sarah Bessey’s 10 Books a Day for a Week series dramatically increased my to-read list. I have something like twenty books out from the library right now, which I recognize to be a bit ambitious, but I didn’t actually think through the fact that they would all come in immediately when I initially reserved them. I started with one that I’d been wanting to read even before the 10 Books week, so I was pleased to see it on the list of several of the commenters. 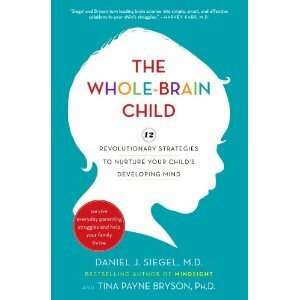 The Whole-Brain Child: 12 Revolutionary Strategies to Nurture Your Child's Developing Mind by Daniel Siegel, M.D. and Tina Payne Bryson, M.D. I have a new-found passion for learning about child development, particularly that of the brain, since we started fostering. This book has been on my reading list for awhile; at the Tapestry site, they recently concluded a series based on this very book. Most people lack even a basic understanding of the brain and how it works, so it is no wonder that we have so much trouble with different aspects of parenting our children. This particular book aims to remedy that situation. By understanding our child’s developing brains, we are better able to make decisions to make our parenting easier as well as more successful for our kids. This is a continual struggle for me in parenting. I’m constantly evaluating if my own standards and lack of understanding and empathy for their development is making it harder for them to succeed. I want to set my children up, not for failure, but for success. This book has been so helpful in giving me some concrete ideas on how to do that. The other thing I’m loving about it so far is the tender way it addresses parenting as well as the plain-language explanations of more complicated scientific data and terms. In case you are interested and want to read along, I’d love to discuss this with you as I chronicle my own thoughts and light-bulb moments: a parenting book club of sorts. I’d love to discuss my take-aways from the book even if you can’t read it yourself. I love the sharpening of skills that comes from discussing parenting with other mamas.